The documentary film "Cowspiracy," released this week in select cities, builds on the growing cultural notion that the single greatest environmental threat to the planet is the hamburger you had for lunch the other day. As director Kip Andersen recently told the Source magazine: "A lot of us are waking up and realizing we can choose to either support all life on this planet or kill all life on this planet, simply by virtue of what we eat day in and day out. One way to eat takes life, while another spares as many lives (plant, animal and otherwise) as possible." James McWilliams, vegan author of the 2013 book "The Politics of the Pasture," argues that modern agricultural, and the cattle industry in particular, are part of a global food-supply system so damaging that the only moral solution is to give up eating meat entirely. Each to his own, you might say. But these ideas are working their way into government policy proposals. For example, Angela Tagtow, a self-described "environmental nutritionist" formerly with the Minnesota Institute for Sustainable Agriculture, was recently tapped to head the U.S. Department of Agriculture's effort to revise federal dietary guidelines. This is a sign that the new recommendations are likely to go beyond nutritional science to incorporate environmental considerations. Many observers believe that meat will be specifically targeted for scrutiny. Environmental nutritionists argue that the social and environmental costs of meat production—obesity, chronic disease, the production of green-house gases such as methane, etc.—are not reflected in prices at the grocery store or restaurant. "The big-ticket externalities are carbon generation and obesity," New York Times columnist Mark Bittman recently wrote. He argues that beef prices don't reflect these externalities and that "industrial food has manipulated cheap prices for excess profit at excess cost to everyone." That the price of meat is too low might come as news to food consumers who, according to data from the Bureau of Labor Statistics, paid 14% higher prices for ground beef this June than they did in June 2013 and 29% more than two years ago. Recent droughts and high corn prices—due in part to Washington's support for ethanol—are largely to blame. It is unclear how high prices must rise to overcome the view that meat is "too cheap." Some industry critics have even called for new "meat taxes" to discourage consumption. Those who promote sustainable agriculture often push for more "natural" production systems, such as grass fed, local, or organic beef. But these result in lower productivity, greater water and land use, and higher carbon footprints. More broadly, the argument that modern agriculture is a leading cause of global warming is tenuous at best. The Environmental Protection Agency estimates that U.S. agriculture, including livestock production, accounts for only about 8% of total greenhouse-gas emissions in the country. 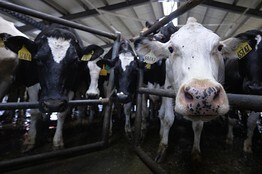 Livestock in the U.S. have lower greenhouse-gas footprints than in other parts of the world. This is partly because American producers generally use higher-quality feeds, higher-yielding breeds, and more productivity-enhancing technologies such as probiotics, vaccines and growth hormones. Future improvements in feed and animal genetics could further reduce animal-agriculture's impact. As economists have shown, one should not underestimate the ability of innovation, markets, the courts and private negotiation to resolve the adverse effects of externalities. Moreover, the concept of externalities when applied to food is nebulous. At a recent Institute of Medicine meeting I attended, a room full of Ph.D.s struggled to understand exactly what to measure. We would never trust a group of experts to set the price of beef, milk or automobiles. We rely on a decentralized marketplace to aggregate disparate information unknown to any single person or expert committee. And yet there is a belief among some that public-health experts can accurately divine a single true and just cost for a hamburger that will help prevent the melting of the polar ice caps and save millions of lives and billions of dollars in health-care costs. Never mind that the nutritional composition of beef provides much-needed protein, vitamins and iron. Studies have shown that higher beef prices lead to iron deficiency and more cases of anemia. It is hard to project the unintended consequences of policy-induced reductions in meat consumption, but they are likely to include reduced incomes for family farmers and rural communities and cast uncertainty over the use of millions of acres of grassland that currently support cattle producers. Let us also not gloss over what is beef's most obvious benefit: Livestock take inedible grasses and untasty grains and convert them into a protein-packed food most humans love to eat. We may be able to reduce our impact on the environment by eating less meat, but we can also do the same by using science to make livestock more productive and environmentally friendly. Mr. Lusk a professor of agricultural economics at Oklahoma State University, is the author of "Food Police: A Well-Fed Manifesto about the Politics of Your Plate" (Crown Forum, 2013). Let's see if I have this straight. The grass captures CO2 when it grows. The cows eat the grass then belch and fart CO2. Alternatively, we can let the grass grow and in the winter when the grass decays the microbes can belch and fart the CO2. When the bugs eat the grass, as the bugs breath they release the CO2. We better kill the grass or we are all doomed. Oh, bad me. Just ate two hamburgers. I feel SO guilty! Is it my impression or are the warmists getting ever more desperate and hysterical?